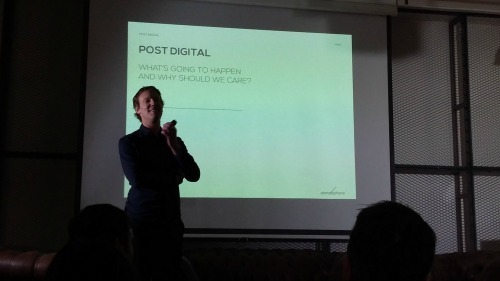 This month's UXPA event was looking at What Happens Next in UX Design. We had two excellent speakers, Pete Trainor and Ben Hart. He started with a history of the three industrial revolutions and how they have changed our world before asking how much of the social media we see now is 'click baity' or 'gossipy' rather than information about the people we are actually interested in? And how often do we spend hours looking for deals which might save us only £20? How much is our time worth? What Ben was getting at was how many of our current digital experiences are lacking in meaning and purpose. He believes the 4th industrial revolution is coming, maybe even starting and this is where we will start to create digital experiences with real meaning and purpose and in turn impact. "Everything is not digital. It is feelings, people, humanity." Which linked really well into Pete’s talk about 'Don't do things better, do better things'. I received his book Hippo The Human Focused Digital Book for Christmas and realising he was speaking this week I moved its priority up my reading list. I will review it next week. 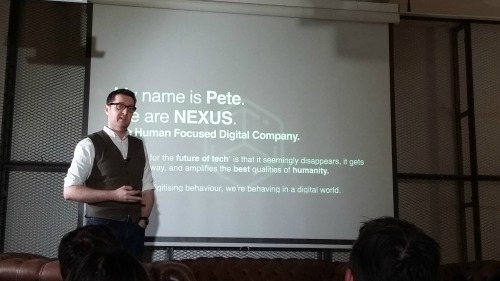 Pete believes we are better than machines and that human factors affect everything we design. He talked through the sections of his book, which was really interesting seeing as I am reading about them right now too, however it was the case studies at the end which really interested me. He is working on a 'chat bot' which can help people who are feeling suicidal. Suicide affects far more men than women and part of the problem is that men find it hard to speak to anyone about their issues. By giving them a computer to talk to his team found they could get to the problem quickly and hopefully help them. It is still in testing at the moment, but it is the other side of this research which gets really dangerous. By using what they have learnt with their tests they can now use the data on your phone to predict those people who might have any issues. Sounds good right? But to do that they would have to look at the data on everyone's devices to pick out the people with issues. And of course this data could tell them much much more than just whether you are thinking about killing yourself. And so we hit the ethics of post digital. There was not time to really get into this, but I think it is something we will all have to start thinking about more, before digital goes much further. Both talks were truly inspiring and left me thinking hard about the impact my designs might have in the world and how I can improve my thinking. I look forward to reading more of Pete’s book and seeing how I can take his thought forward in my work.